A project management introduces and follows new techniques and technologies that require fulfilling their specific needs related to their projects. Now current project management need flexible and skill to manage all changes according to information. For this purpose, agile project management is going to use. APM depend on incremental planning and use iterative approach that help to complete the project step by step with all requirements and facilities. This project management is more suitable for exploratory projects where new technologies and discoveries are going to explore. Agile special method name. Scrum used to explain all the process and principles used in this system. In this management system, all risks and problems are identified with the completion of project and sort out all those problems before further completion of project. Agile project management relate to rolling wave planning and proper project planning. This iterative process give some advantages like early detection of problems and defects, frequent demonstration of project provide full customer satisfaction and continuous verification and integration of the product occur. Some basic principles of agile project management are: full attention on value of customer, self organization, improvement at continuous stage, incremental and iterative delivery and adaption and experiments. Agile project management has very beneficial at different projects and help management to accomplish task according to requirement of customers. Project management is very difficult in completing many projects. Proper management is required because without this no any project team can do exact project, not utilize the right skills or personalities, not organize the functions in the organization, or may not give results according to required skills. First we have to focus on management responsibilities. All responsibilities are occurring in this project management like manage the vision, manage the ROI, manage the process, manage the iteration development and manage the release of product. A share vision must be developing to get successful results from agile development. The vision of the project must be share with all the team members who work in the company. If vision not shared properly, then project feel difficulties with all the tasks and procedures related to it. Agile project participants share their work on daily basis to share more knowledge and information. Customer or product manager develop the vision of project, not agile project manager. Project manager help in explaining the vision of customer into meaning full information for the understanding of all employees. Agile planning is because of investment vision in which management adjust and assess the investment, present a setup of proper understanding which show collaboration, adaption and emergence and develop different expectation related to progress of project. Agile project pay more attention in implementing the vision of the project. Work in agile project is just like a person who avoids obstacles according to current situations. It provides looking ahead and forethought for improving its journey towards the completion of project. In different agile processes, during iteration, a small set of features is going to develop which decide the team members and next iteration step according to need. This maximum focus enhances the productivity and one conclusion push the next one to come and do its performance. Manager has to look at their next step before the actual occurrence of task. Team members are also considering as problem for the agile project. Different agile programs depend on self organizing but the project manager not left the team loses the project. The manager of agile project also checks all the policies and rules have to be followed or not. All team members are very much effective and work with great efficiency to perform their duties. The performance feed back show the excellent individual performance in the team of project. Traditional system give attention on cost, scope and time at the time of planning where as agile give relaxation to its team, flexibility and customer collaboration. Basic purpose behind agile management to utilize all required changes and combine efforts to provide effective result. Some other differences are given: agile is completely prepare for customer where as other software focus on preparing plans. Agile prefer on acceptance of all required changes and give required response but other approaches have to control all changes during the project. Agile consider as evolutionary project which completed with speed and according to customer demand. Traditional management follows a specific hierarchy for completion of task. 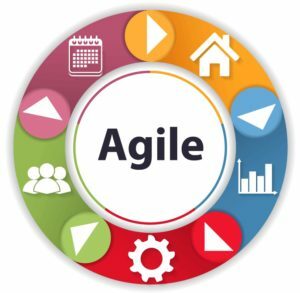 Agile control its team and providing them self manageable and self sufficient, agile process is customized which more involve the customers and agile process depend on the product that is actual need of customer according to its needs and satisfaction. So agile project management is preferred by management because it divided into parts which known as iteration where after every step results is given to customer and success of these iteration is consider the success of project. Self organized management team work in agile .different group of employees interacts with each other for process and project discussion. Agile project include product owner, the team and the scrum master. Customer engagement is most important factor of agile. After every iteration, customer verifies the product, give its feedback and then work further if any changes required or not. Some other difference between traditional management and agile project management are flexibility, ownership and transparency, problem solving, checking point and monitor progress. Actually Agile project management is very unique due to its qualities and working style. Managers use this system when they want continuous customer feedback and want to develop product according to need and requirement of customer, for this they have much flexibility in their setup and having a team who is self organized and depend on their decisions. Different type of methods are used in the agile project management which are scrum, rational unified project, extreme programming, agile modeling, crystal clear, dynamic system development method, lean development and rapid product development. Agile project is a very difficult task if management didn’t handle it properly, it receive different problems while completing their projects : software product owner; many agile projects give attention on software product owner and also focus on that person who has holding two full time jobs.transiton from software based projects; this is a major problem to come over the software based project in comparison of company base projects. Difference between project and product management; both management are different from each other and create difference while working in agile project management. Project management is a process of developing services or products where as product management is a continuous process. Product is needed to evolve new features and project is run successfully with moving process. Every product consider as an individual project which more focus on innovation and evolution. Inefficiency in large projects; agile management is not suitable for large organizations and for large projects because its working start without any control and without any starting point so it not reasonable for large project organizations. Leveraging the role; it is difficult to find the roles of project manager according to techniques. Agile manager’s role also same like project management with additional changes and pick roles in regular process for any production sector. Agile process becomes the fastest process to manage the project. With the passage of time the usage of agile increase. A demand for more evolutionary and adaptive process is going to enhance in different organizations, project managements and teams. Agile provide rapid changing product in a fast changing business world to compete the market and technology. Many participants said that after implementation of this project, our skills to manage the changing priority going to be improved. Agile is suitable for such project who has different parts or steps that can be revised and better condition at the reached to final product. So many different and other benefits are here for the usage of agile. For selection of agile some reasons are given here; empower project team to work with more creativity and effectively. Agile is evolutionary which provide opportunities to learn more about new iteration to its team members. Quick feedback received by team after every iteration. Agile give opportunity to provide prototype and improve its quality in every cycle. Team can determine a prototype for the further versions. Team can handle more easily all changing priorities. Stake holder also gives quick feedback and team do quick course of correction on the feedback of stakeholders. Its flexible and fast process improves its production capacity. It supports collaborative and regular troubleshooting. Teams can measure all changes occur in the future. It help in prioritize the work and features for team and individuals. Agile methods are considered as roots in software industry. They provide different development opportunities to organization which improve their productivity and uniqueness. By studying experiences of different managers, we see that when manager use agile project management their team can easily beat their targets and project schedules which is a unique case in the company. The continuous success and improvement in the development of software have recommended adding the agile PM in the project management body of knowledge. But the main thing is that Agile not satisfy the top management related to budget, schedule and scope control requirements. Buyer wants their required product without thinking about the cost of product. Agile methods not suitable for providing estimation of tome and costs which is real need of management. So in this situation, many organization adopt ceiling strategy in which highest budget not exceed from the procedure of development. Some features of agile not suitable in the corporate culture like intense collaboration and self organizing. Many companies use agile project system and reduce the number of to p management due to lack of collaboration with senior management. But agile methods also fail in different situations due to; less experience in agile method, less support of management and agile values not comply with company culture. So agile can perform its best on small projects that have team of five to nine members for accomplish the tasks. Time taking documentation replaces with face to face communication and top down control change into informal coordination. But there are also some companies who use agile for large projects and also face too much challenges. Many companies use agile with some other combination to get maximum results and satisfaction regarding their products. In large projects, companies distribute the large projects into small iterates and make or develop strong history using agile approach, and agile is consider as part of their culture of product development. Agile need customer involvement and it reach in different ways. For an individual it is easy to handle customer according to its needs. After all above study we conclude our discussion in such a way that agile project management is a very helping and supporting approach which is most suitable for small projects. Customers are fully involved in the production or development of any product; they check the product at every step and put some change according to their need and requirement. This provides a flexible system of production which faces all the priorities and changes according to requirement of customer. But this approach fully satisfied to customers and they have to pay reasonable amount against their required product. No detail planning or lengthy process is requiring in this approach which used in traditional managements. But different companies still use traditional methods because agile not suitable for their system and another reason for not accept the agile is its lack of control and not authorized by specific entity. It provides full authority to its employees to deal with customers face to face and provide them services or products which they demand. But overall agile project management is helpful in attracting more customers and provide flexible environment to all employees and team members. Thinking Portfolio. (24.4.2016). Key Issues for Agile Project Management. Carr, K. ( 16th Aug, 2017). Agile Project Management Vs. Traditional Project Management. Cohn, M. (published in Agile Times Newsletter on 2003-01-01). The Need for Agile Project Management. Sussex, T. (December 16, 2014). 13 Reasons Why Teams Are Using Agile Project Management. Yatin. (February 12, 2017). What is the difference between Traditional and Agile Project Management. Zahid Ali Masood1*, S. F. (20-28, 2017 ). The Benefits and Key Challenges of Agile Project Management under Recent Research Opportunities.